Our 32,000 square foot facility is custom-built and is bright and spacious. Trillium School is located at 4277 14th Avenue in Markham, Ontario. The school can be found on the south side of 14th Avenue between Kennedy Road and Birchmount Rd. The 32,000 square foot facility was custom-built in 1996. The building is bright and spacious and features a full-sized gymnasium, a computer lab, science lab, library, and a designated kindergarten playroom. Students have specially-designed cubbies and lockers for their personal belongings and mudrooms to store their outdoor gear. The school is situated on 3 acres of land. The school yard features a large level playing field, an extensive tarmac area, as well as a permanent play structures for younger children. For security, the entire school yard is enclosed by a 6 foot-high steel-link fence. Trillium students also enjoy direct access to Milliken Mills Park, which borders the school yard to the south. The park is home to a variety of facilities, including baseball diamonds, soccer fields, playgrounds, and a mini water park. Trillium students regularly access the park for sports, play days, tobogganing, and other special events. The school is also in very close proximity to Milliken Mills Community Centre, which houses a public library and swimming pool. 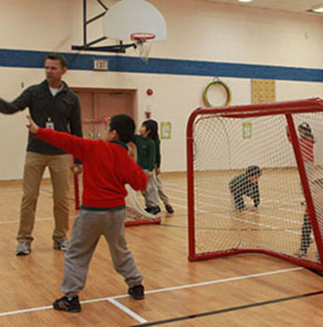 Trillium’s elementary students use the Centre regularly as part of their extra-curricular program.